When 15-year-old Charlie returns home after serving time in a Juvenile jail, he's not Charlie anymore. Lafayette calls him Newcharlie because he's not the loving big brother who went away: he's a real mean replacement. Ty'ree, their older brother works full-time and tries to hold the three of them together, even though he dreams of studying at University. But it's hard being a family with Newcharlie the way he is. Poverty and gang violence in an urban US setting are central to Miracle's Boys, so you'd be right to expect this story to be dark. But 12-year-old Lafayette is our guide. His thoughts and words are raw, honest and heart-warming. Lafayette took hold of my heart from the first page and would not let me go. I needed to know whether his tiny family would make it together or fall apart under the strain. There were so many reasons why their chances were slim, but family has a way of working unimaginable miracles. Jacqueline Woodson cracks open the heart of characters with so few words, it's breath-taking. It's no wonder she's a multi-award winning author. 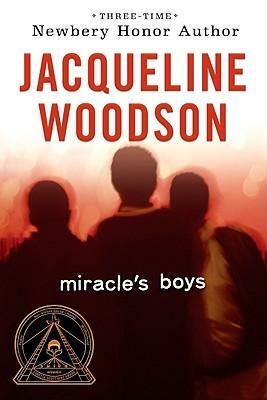 Miracle's Boys won the Loretta Scott King Award, which is given annually to outstanding African American authors and illustrators of books for young children and young adults. This award commemorates the life and work of Dr Martin Luther King and honours the work of his wife, Loretta Scott King. The award focusses on stories that demonstrate an appreciation of African American culture and universal human values. Engraved around the borders of the winner's plaque are the words 'Peace', 'Non-Violent Social Change' and 'Brotherhood': words that epitomise the essence of Miracle's Boys. But even as the story circles these principles, the core of Miracle's Boys is set deep within the yearnings of a young boy whose world might easily be overwhelmed by the opposite. Miracle's Boys is a timeless bitter-sweet tale of love, loss and courage.